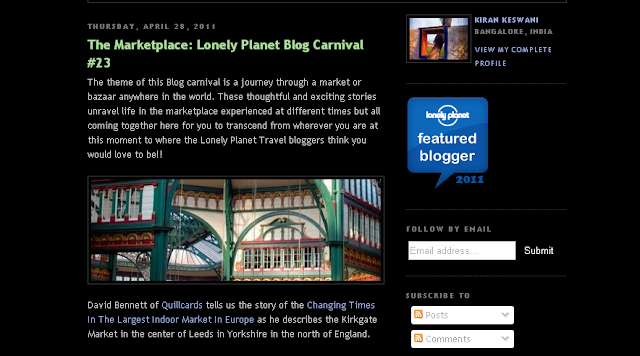 Now for the second.... For the first time, I am part of the Lonely Planet Blog Carnival. This is the 23rd such carnival, where Lonely Planet featured Bloggers from around the world write on a chosen topic on their own blog, and all such posts are collected and posted on the blog hosting the carnival. This time, the carnival is being hosted by Kiran Keswani, a fellow blogger from India, who writes about Indian markets on this blog, aptly titled "Indian Bazaars'. Of course, the topic this time is 'The Marketplace', and among posts about markets from all over the globe, Kiran features my blog on the Hampi Bazaar. Go ahead and take a look for a virtual tour of markets from around the world! You can read the article here or click on the pic below.. There is a lot more I need to write about, but that will have to wait till I have time to sit down and put all my thoughts down..... and since there is a lot more travel lined up ahead, plus Samhith's vacations which have started today, it looks like May will be a quiet month on the blogfront. Of course, I shall still post photos and articles about happenings as and when I can, so please do keep coming back..... and I shall be back with a bang as soon as I can!